Cheap Tunes Tuesday has become an institution for me, and hopefully it has for you as well. But so often, I feel like it’s also a #throwbackthursday because of how many artists and songs remind me of childhood or other distant memories. Today’s act reminds me of getting my first stereo and blasting the radio in my bedroom as a little kid. Back in 1992, Jason Ross and Jason Pollock met while attending William and Mary college in Virginia. Discussing their love of music and adoration of guys who play in bands, they decided to start tinkering. They split up some songwriting duties to see who’d come up with better stuff, and Ross was elected to lead vocal/guitar and Pollock went to lead guitar and backing vocals. Eventually they snagged a bassist and drummer and business was about to pick up. Starting in the local coffeehouses and clubs, they band started to generate a little buzz. Needing a name, inspiration struck one fortuitous evening when they were watching an old episode of CHiPs. While probably not an Emmy worthy program, ‘7 Mary 3’ was the call sign for Officer Jon Baker. Pollock noted, “There’s no great significance or anything. We were just tired of trying to think of a cool name.” So there you have it! They dropped a self-produced EP called Churn in 1994 that generated some airplay in the Orlando, Florida area. Due to the success, they relocated to the Orlando area and began expanding their fan base. The regional gains turned into national ones and major labels began hounding the group. Signing with Mammoth Records in 1995, they put out their official debut album titled American Standard in September of ’95. Sales were solid, hitting platinum status in the U.S. in just seven months. Backed by monster single “Cumbersome,” it shot up to #39 on the Billboard 200 and #7 on the Hot Modern Rock charts. While some chastised the grunge sound and compared them to the larger acts of the moment such as Pearl Jam, the difference was in the themes and styling of the album. Given that the guys were basically fresh out of college, the perspective and life experiences to date were so different—and truthfully, they were still finding their sound. This is definitely one of those nostalgia acts for anyone that really listened to mainstream radio in the mid 90’s. Is the album an iconic masterpiece? Probably not—but given a few college kids first effort, it’s beyond solid. And they had three tracks that were such chart performers; they remain staples on 90’s or grunge-era radio stations to this day. Ross’s raspy vocal and unbridled passion on a couple tracks makes the album worth listening to by itself. In 1999 Pollock left the band abruptly after suffering from writer’s block and burnout. 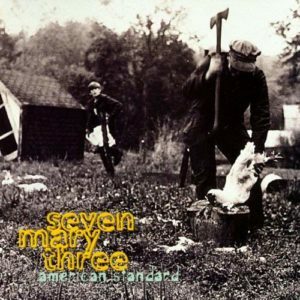 Seven Mary Three continued on, but the follow-ups never quite caught on, with limited sales across the board. They’d give it a go another 15 years, and then call it quits officially in 2012 with no real announcement or fanfare. Ross has since become the head of The Bowery Presents, one of NYC’s most powerful music production companies. With roughly five million copies sold, this album is part of music history, no doubt about it. If you feel like you need to be transported back to 1995 in a flash, just toss this one on today. I understand it can feel cumbersome at times to take the headphones out, load up your preferred music streaming service and search for a band, but this one is worth it today. You might even consider it a standard in your rotation going forward. Thanks Mike!! Appreciate your reading and commenting!